The intensity of positive or negative energy varies within each home, depending on its occupants - both past and present. Your home - the space you come home to every night, the place where you go to escape the craziness of the world, pressures of work, daily stresses and the such - should be a place where you feel safe, secure and comfortable. Your home should be a place where you can relax and get away from the outside world’s demands and pressures. Your home should be your sanctuary. If you don’t feel an immediate sense of ‘sanctuary” when you enter your home or that of being calm, happy and peaceful - you may need to clear your home of negative energy. How do I know If need my house blessed/cleansed? Do you ever get an uneasy feeling, have a chill run down your back, or get goose-bumps for no discernable reason? Have you ever seen something move out of the corner of your eye, but when you look, nothing is there? Do you wake feeling unrested after a nights sleep? Do items like your keys or jewellery frequently get misplaced or lost? Do you feel an unfounded sense of dread in a particular area of your home? Do you feel you may have a ghost or some kind of presence in your home? 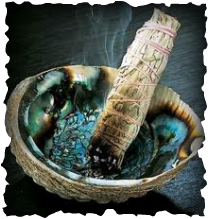 If you experience one or more of the above, a home blessing and cleasning may prove quite beneficial. A home or office has the ability to capture and hold both negative or positive energy. Negative energy manifests through low-vibrational thoughts and ideas and is expressed mentally, physically or verbally. Anger, sadness, resentment, fights and arguments, bad thoughts or memories of events or people, hateful or harsh words spoken, in the home or office place, can gather and remain in a buidings energy field. This type of energy when trapped, can cause discomfort, disharmony, arguments, illnesses, physical symptoms, mental symptoms and emotional symptoms, etc. Once this energy is trapped in this way, all who live or work within this space can be affected, creating an endless cycle that continually emits and regenerates this negative energy. Breaking the chain by clearing the negative energy from the space is necessary for restoring peace and harmony. Houses and buildings inherit energy from previous occupants so it’s always a good idea to cleanse the home or building of unwanted energy before moving in even the first piece of furniture. Our goal when clearing and blessing a home or work space is to get rid of the old, stale negative energy, clearing it out and replacing it with good, clean, clear, loving, happy energy - providing a calm, balanced, and peaceful environment for work, play or living. Also blessings of an individual, who may feel down or depressed and in need of some positive energy can help. This service is charged at an hourly rate, plus travel expenses. The charges are for materials required for the ceremony and our time only, the charge is not for the blessing or clearing.